Ear surgery is a very popular procedure in both children and adults who have disproportionate or protruding ears. It is often referred as ear pinning or medically as otoplasty It is often done in the child hood years to prevent ridicule or bullying. However, a number of adults’ desire otoplasty. Why? Women feel uncomfortable to wear their hair up or pull their hair back in a pony tail. Like wise men often cover their prominent ears with long hair styles and thus can’t wear short hair for fear of embarrassment or ridicule. The surgery can be done at any time after 5 years of age. Dr. Hardesty combines his reconstructive surgery training and talent with aesthetic surgical experience to deliver positive outcomes for his patients. Ear surgery, also known as otoplasty or ear pinning is a procedure that helps to create a more aesthetically pleasing look to the ears. This surgery helps reduce large ears, shape ear lobes, correct disproportionate ears, restore prominent ears to a normal position and restore ear loss. This treatment is also helpful for those who have had injury to their ears. 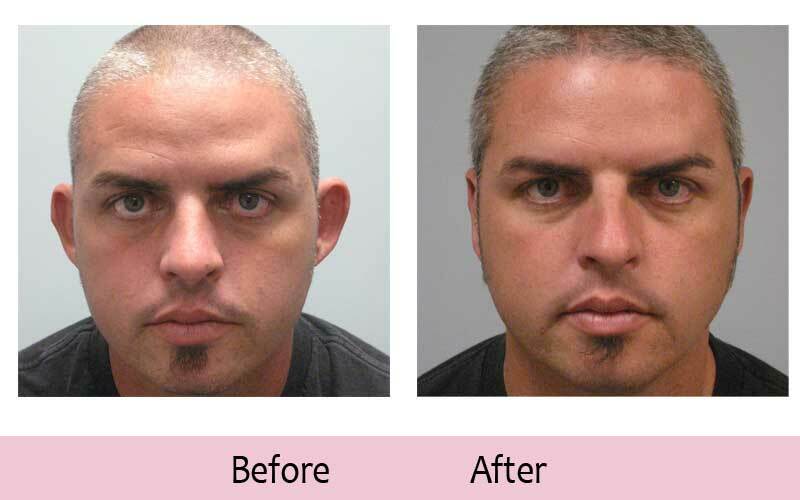 Otoplasty creates a more natural shape and look so that you can start feeling more confident. If you notice that your ears are bothering you or your child is having issues with their ears, then Dr. Hardesty can help you to get a more desired aesthetic look. Children above the age of five are able to undergo this procedure, since this when the ears cartilage is stable enough for correction. The way that a plastic surgeon will go about performing an otoplasty procedure differs between adults and children. Since cartilage hardens over time, adult otoplasty involves additional steps than child otoplasty. Splints: With children under 6 weeks of life their cartilage is soft enough that doctors can use splints for contouring. This is a non-surgical procedure and the mold can often be taken and a splint fabricated and worn for several weeks to months until the ears are in a normal position. Incisions: With both adults and children an incision is made behind the ear that is hidden and when healed is almost imperceptible. In adults their cartilage is harder, so the cartilage Is mechanical softened so the permanent sutures will hold and allowing repositioning the cartilage and prevent recurrence. The placement of the incisions in the ear will depend on what changes you wish to be made in your ears. 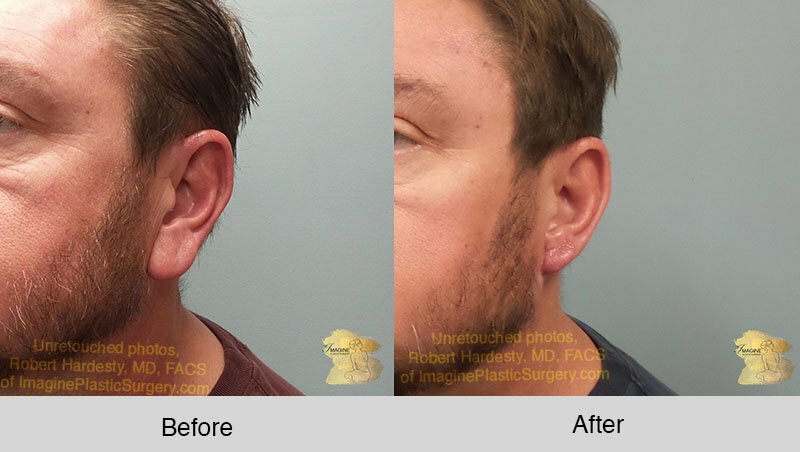 Dr. Hardesty usually makes a non-noticeable incision behind the ear and very rarely in the hidden grooves of the outer ear. Dr. Hardesty can remove extra tissue and cartilage or re-create folds that are missing from the ear. A combination of techniques is often used to obtain the desired result. Dr. Hardesty will provide instructions for pre-operative as well as post-operative care. Recovery from surgery usually means remaining at rest for a few days after the procedure. After this time period you can return to normal daily activities without any dressings or bandages. At night or when sleeping for the first 6 weeks it is highly recommended to wear a sweat band or beanie to prevent the ear accident getting pulled and the ear returning to its pre-surgical appearance. It is also important to follow post-operative instructions in order to help ensure a smooth recovery. The positive results from the procedure are immediately evident and continue to improve as the normal and usually minimal swelling resolved usually within weeks following surgery. How Do You Wash Your Hair After Ear Surgery? It is important to keep the incision dry for three days post-operative. After 24 hours you will be able to wash your hair carefully avoiding the surgical site but is important to avoid soaking or scrubbing the ear. How Old Do You Have to Be to Get Otoplasty? This procedure can be performed at any age once the ears have reached their full size. This happens around age five so typically it can be done after that. Can Otoplasty Be Covered by Insurance? Ear pinning and ear reconstructive surgery may be covered by some insurance providers, but most otoplasty procedures are not covered since they are seen as cosmetic. If you have any questions on your coverage, we encourage you to speak with your insurance provider. If you want normal appearing ears and attain the shape you’ve always desired, then contact our Riverside office today. Call us, take our self-assessment survey, or fill out a form online and our team will get back to you. The team at Imagine Plastic Surgery is ready to help you with all your aesthetic goals.